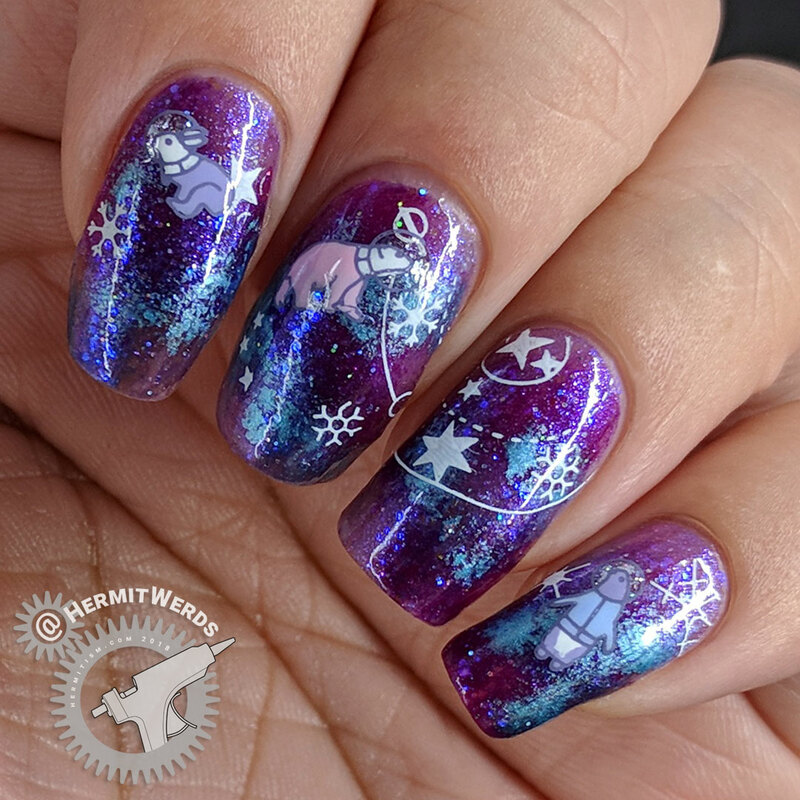 Someone had a galactic challenge prompt (that I missed) and two other challenges had snowflake prompts (that I’m late for) and the stamping plate I used today had this lovely combination of both. And so I found myself painting classic galaxy nails even though I’ve said several times that I’m not interested in painting them. I used it as an opportunity to play with opacity and didn’t use any black, so it still fits my style quite a bit. The real lure was the cute astronaut animals on a Christmas stamping plate of all things. I can only wonder if Born Pretty was inspired by Nicole Diary’s galactic themed Halloween plate Festival ND-002. It is almost fully a space/Halloween mashup. I was so sad that it did not arrive in time for this year’s Halloween, but @ClaireStelle8 said there would be Halloween in May challenge prompts from her. Lisa wants. The blend of images on this plate all matches stylistically, which makes me very happy. Lots of the images can be used outside of the holiday season and into plain ol’ winter. 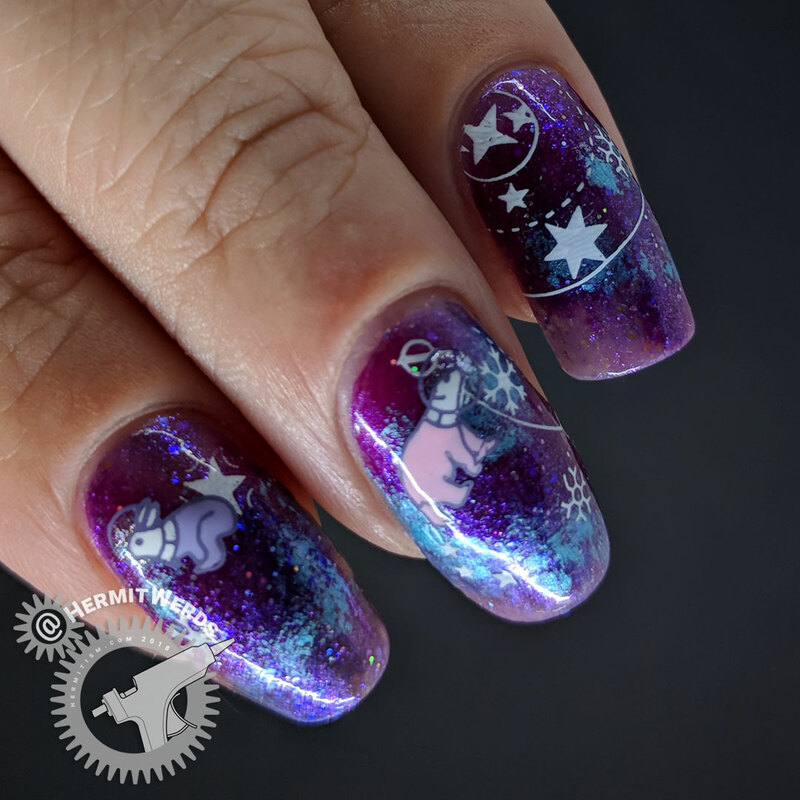 Plus a lot of them are smaller images (just like the Nicole Diary plate) so I can use these on my stepdaughter’s wee nails if she’s so inclined. Out of the six full-nail images, all three of the larger Christmas trees probably won’t be the best for someone with narrow nails. The most narrow tree is .9 cm across at the base, which means you mostly wouldn’t want to fit the whole tree on your nails even if they’re long enough for it. Bummer. 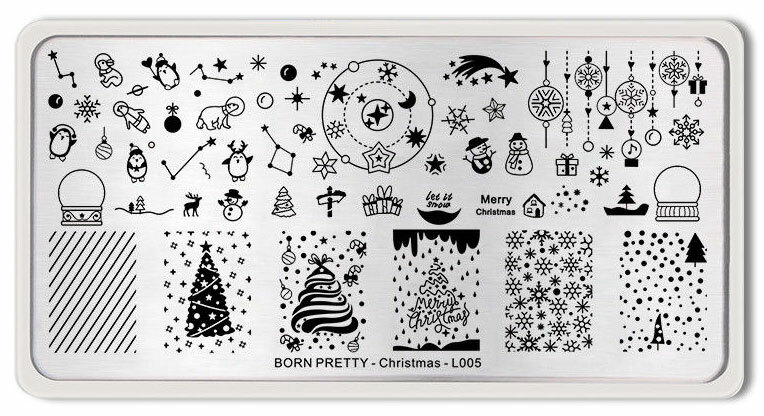 For me, this is the best Christmas plate Born Pretty released this year, but I reserve the right to hate on it when I paint my snow globe nail art. Layered stamping images take so much planning to work well. This design may not be what you normally think of when someone says “pond mani” but that is exactly what this is. 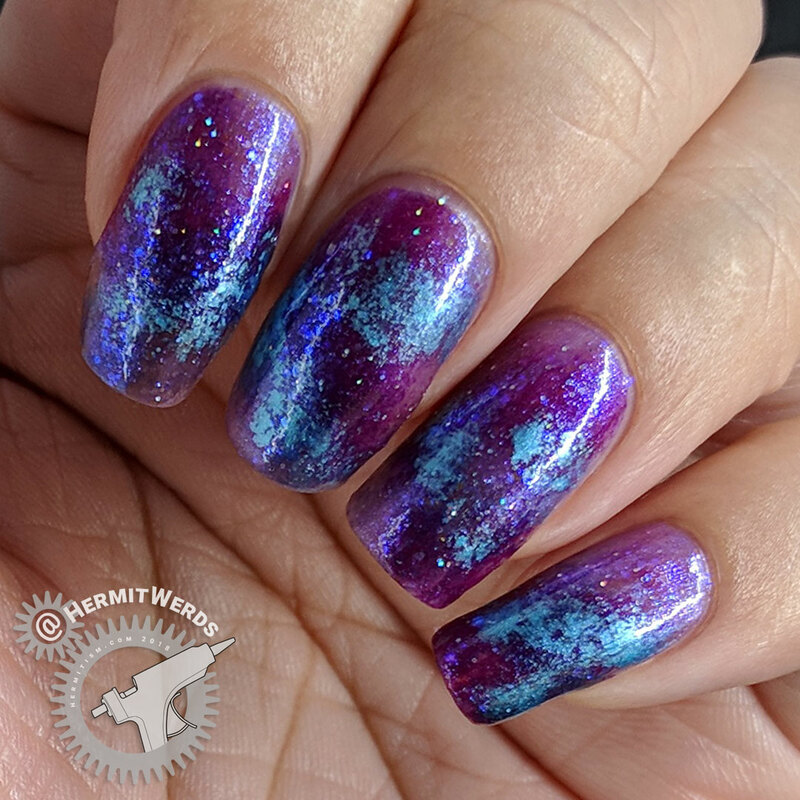 I used a slice of sponge to apply a few splashes of metallic magenta and aqua and then I layered two coats of the super glittery purple “Interstellar” jelly on top. Finally, I sponged on a tiny bit more metallic aqua. Then I stopped and admired the way that looked for a day. Yum! Okay, I was admiring it, but I was also caught in an indecision loop because I couldn’t decide what colors I wanted to use on top. I debated on more “Cool Aqua” or lavender, yellow, silver or white for the star/snowflake stamping. White seemed like the best answer, but I wanted to use a different color for the astronaut animals and white would look nice for them too. I definitely didn’t want to use black because I thought it would blend into the background too much and I had a penguin to paint. 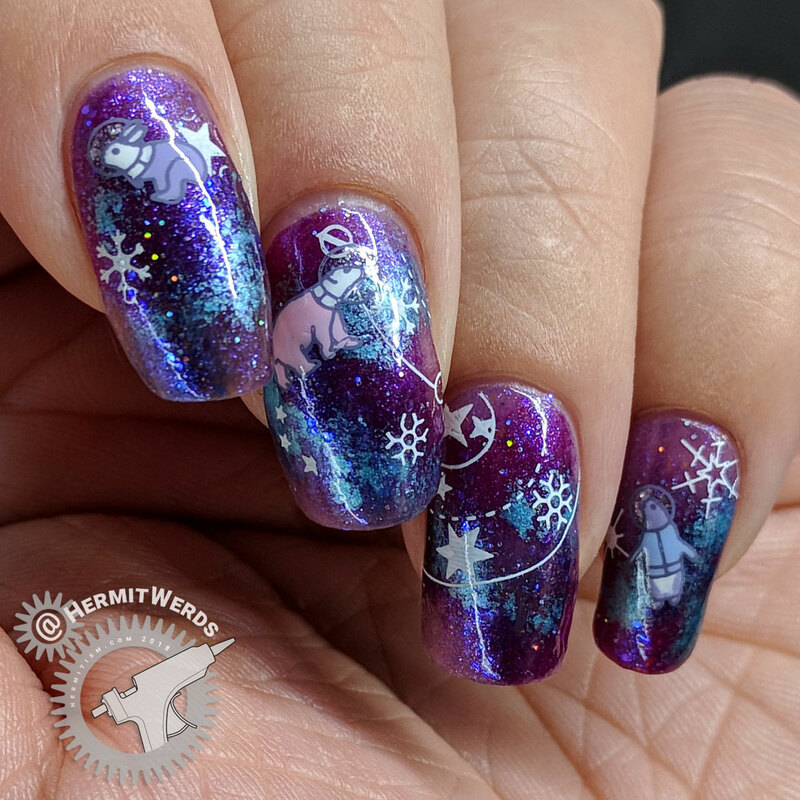 Finally, I realized I wanted to fill in the animals with white so I settled on a light purple for stamping and picked pastel versions of the galaxy colors to fill in their space outfits. How to paint the animals was also an interesting debate. 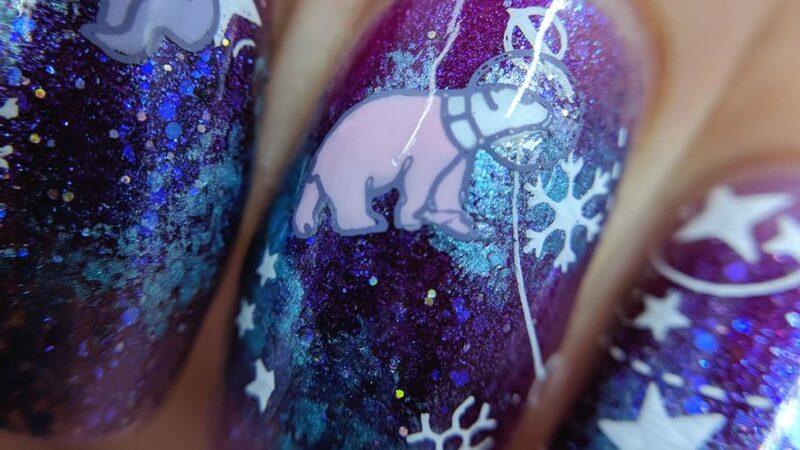 Born Pretty’s graphic designer colored the space between the polar bear’s body and the helmet red, implying a collar and no need for a full space suit. I decided to go the opposite way because it felt like the penguin had been fitted with a kind of jacket and I was using all three animals. If I use these again sometime, I will probably try them the other way just for fun. Finally, I added a little bit of sparkly white glitter polish inside the helmets because I wanted them to be mostly transparent. This year’s Halloween was full of lots of very classic Halloween themes and I chose the challenge prompts I did because I wanted to put together a good body of those classic themes. My plan is to do the same this Christmas, even though I’m getting a slow start. We’ll see how many I get through. 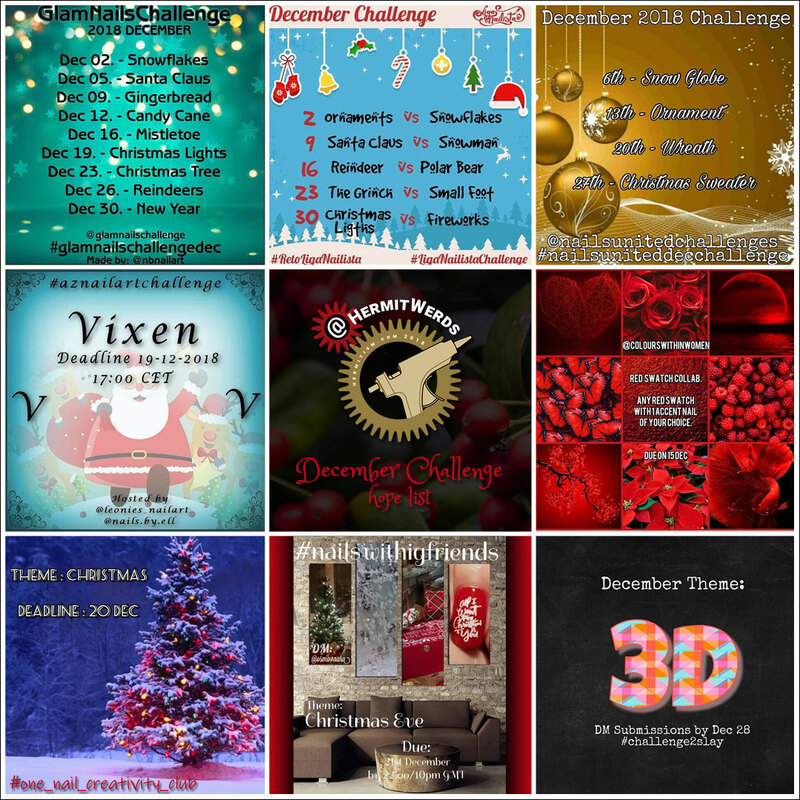 You can see the full list of challenge prompts I’m looking at for this year at the end of the post. I will be combining prompts, but I will say that snowman nails this month are unlikely. There will probably be some in January, but if this makes you sad, check out my snowman tag. They will rise again! If you’ve been with me long, you know that I’ve been talking about going through my entire collection and using things at least once. Instead of concentrating on knocking out all the easy one or two unused polishes in a brand, I focused on Sinful Colors/Shine in September and found I had 52 still to go (53 now, since I bought “Witch, Please”). So how have I been doing? After today’s look I have 33 polishes to go. If my plans bear fruit I will pass my goal of the halfway mark before the end of the month. (7 left!) I have plenty of non-opaque glitters and shimmers and three of the super cool hypnotic toppers. There aren’t many creme or even lightly shimmery polishes in what’s left so this is going to be a sparkly month. That’s nail polish, but I’m not doing so well with stamping plates because I haven’t stopped acquiring them at the same level as I have with nail polish. (Plus I keep reviewing new ones.) Seriously, I have 74 unused Born Pretty stamping plates right now. That is the worst brand for me, but still. Woof. It’s looking like I’m going to have to focus on stamping plates next year.